Sign up for the biggest Big Local event ever! Big Local Connects is the first gathering of all Big Local areas at a single event. 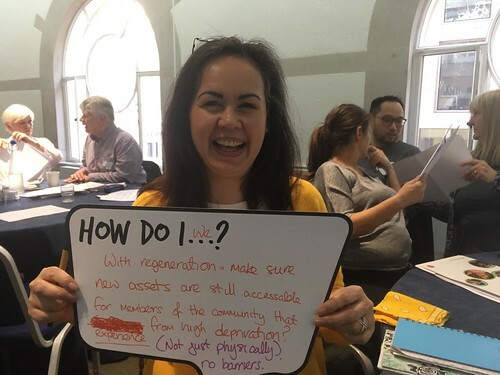 From Hastings to Hartlepool, people are coming together to share their experiences of Big Local, learn from other areas and get inspired by the huge range of resident-led projects transforming communities across the country. Find out more. Join us for the launch of the Local Trust and IVAR report on what needs to change if we’re to build powerful communities in the 2020s. We’ll be holding an interactive event at Coin Street Neighbourhood Centre on 10 July to discuss the report’s findings. Find out more. Lack of bus routes and limited access to services have led to isolation for many of the residents in Ramsey Million Big Local. Val Fendley, Programme Manager at Ramsey Million, outlines how investing in new types of transport and reducing reasons for travel outside the area is helping to alleviate some of the pressure. Read the blog. Sompting Big Local have taken on projects that cover everything from teaching gardening skills to kids to helping older people set up an e-mail account. Thoughtful interventions that are bringing residents together. View the film. The second ever National Survey of Partnership Members opens on 1 May 2018. This is the chance for partnership members to give their view on how much of a difference Big Local is making to their area, and their lives. Find out more. The Government has allocated over £23m between 2018 - 2022 to support the development of neighbourhood plans or neighbourhood development orders. Locality has a huge range of resources and guidance available to support communities interested in taking on a project of this type. Find out more. Have your say on how government can work with and for civil society to tackle challenges and unlock opportunities to build a stronger society now and in the future. Local Trust will be making the case for strengthening local control of decision making and funding, using Big Local as an important example of this in practice. It would be great if Big Local areas had their say. This consultation closes at 9am on 22 May 2018. Take part.